"When I saw some of the terrain that we were fixin' to go over, I just knew I was missing out on hearing my wife scream in that car. That's one of my favorite things." 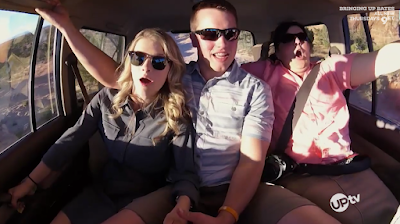 Kelton's proposal may be romantic, but the off-road sightseeing tour that he plans certainly isn't. Sandwiched between Josie and his future mother-in-law, Kelton laughs as the two Bates women flip out. Kelly is especially scared (video below). Can you commiserate with her, or would you have enjoyed the ride? Be sure to tune in for the Bringing Up Bates season seven finale tonight at 9pm ET/8pm CT on UPtv. I have to give it to Kelton, he really outdid himself. That proposal was beautiful, thoughtful, and heartfelt. I hope he continues to cherish and shower Josie with love and admiration! Good job Kelton! I realize Kelton said he was fine with Kelly Jo going in the same car as Josie and him, but for crying out loud, couldn't she have at least sat in the front seat with the driver and let Kelton and Josie have the other seat to themselves? I agree. Do the parents have to be in the middle of every engagement? I love Gil and Kelly but a proposal shouldsbe a special, intimate time between the two young people, not others. When Kelton gave Josie the beautiful packet and charm at the coffee shop, Kelly totally dominated the moment and the conversation. Let the couple have some privacy during this special moment. No, the camera person was sitting in the passenger seat. She had to sit back there. Some drivers don't like people sitting in the front seat with them. How did your parent like the renovations you guys made? I too thought we should have been able to see Kelly & Gil's reaction to the renovations. . . . . perhaps they DID NOT like it??? I (personally) would not have liked my kids doing that to my home. But Kelly does it to their homes when her children get married. It appears that she does the work while they are on their honeymoons! Lately Kelly has been talking way to much. She needs to be more quiet, IMO. I would've been just like the ladies on that ride! Kelton's laugh is cute. He and Josie make a wonderful couple. Many blessings to them.